What began life as an instructional overview of teacher training programs for Industrial Arts morphed into a historical journey of the subject area from the early days of the NSW Teachers Federation. 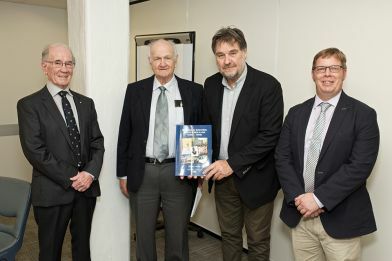 Federation President Maurie Mulheron was on hand to launch Becoming an Industrial Arts Teacher in NSW 1930s-1980s, with authors Geoff Hogan and Arch Park, hosted by the Industrial Arts Special Interest Group at Teachers Federation House earlier this month. “In this, the 100th year of the Federation, we offer a book largely about teachers’ time in schools, covering about 80 of those 100 years,” Mr Park told guests at the launch. The book provides a historical basis for the educational legitimacy of the inclusion of Industrial Arts, known as practical studies, in the school curriculum as well as a background on what began as manual arts. It refers to the complications of staffing newly introduced subjects without specific teacher training and discusses the difficulties this produced. A considerable amount of the material in the book came from first-hand sources of teachers’ written and collected contributions, official archival papers, photographs and considerable government Department and tertiary institutions’ published documents. Mr Park said the book provided “a historically significant, rare, and important” contribution to a much fuller understanding and appreciation of the profession.